... by not allowing the distance it requires. If you're looking right down the throats of the characters, there is no space between them and you; their perspective is your perspective; their emotions are your emotions; you can't frame what you are literally inside of. Moreover, the effect -- and it is an effect even if its intention is to trade effect for immediacy -- is enhanced by the fact that the faces you are pushed up against fill the screen; there is no dimension to the side of them or behind them; it is all very big and very flat, without depth. The camera almost never pulls back, and when it does so, it is only for an instant. 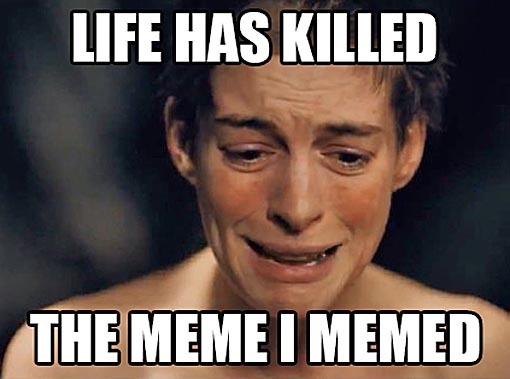 Of course, I didn't have to actually see "Les Misérables" to recognize the self-evident flaws in that interpretation of irony (and filmmaking). But I did anyway. And while I think it's far from a good movie (and even farther from a good musical), I didn't take it as a personal affront. If you recall, two years ago "The King's Speech" was also criticized for its overly literal use of close-ups and wide-angle lenses -- but Hooper seems defiantly intent on making it his directorial signature. (Perhaps in an effort to literalize the Hollywood phrase "too on-the-nose," he either plants the actor's face right in the center of the frame, or off to the right.) Having bragged about putting the camera "maybe 18 inches from Colin [Firth]'s face in the closeup on the very first day" of shooting "The King's Speech" because he "wanted the nervousness of the first day to percolate into his performances," he now (as some have put it) crams the camera down the throats of the actors in "Les Misérables" for reasons that have nothing to do with their, or their characters', performance anxieties. Endless high passion and basic human emotions indulged in without respite are what "Les Misérables" offers in its refusal to afford the distance that enables irony. Those who call the movie flat, shallow, sentimental and emotionally manipulative are not wrong; they just fail to see that what appear to them to be bad cinematic choices (in addition to prosaic lyrics that repel aesthetic appreciation, and multiple reprises of simple musical themes) are designed to achieve exactly the result they lament -- an almost unbearable proximity to raw, un-ironized experience. They just can't go with it. And why should they? After all, the critic, and especially the critic who perches in high journalistic places, needs to have a space in which he can insert himself and do the explicatory work he offers to a world presumed to be in need of it. "Les Misérables," taken on its own terms, leaves critics with nothing to do except join the rhythms of rapt silence, crying and applause, and it is understandable that they want nothing to do with it. Reading the first part of that paragraph you might feel that with friends like Fish, "Les Miz" needs no critical enemies. But that is part of Fish's point -- that criticism is superfluous in the face of such "raw, un-ironized experience." But I quibble with his final sentence, which contradicts everything he's built his argument upon. Far from belong left with "nothing to do except join the rhythms of rapt silence, crying and applause," critics (and members of the audience) do, in fact, have another option, and it is to reject it -- not because it's "raw" or "sentimental" or "emotional" but because it's specious. There comes a time when too much gets to be too much, and we all have our own thresholds of tolerance. Stephanie Zacharek (who said she could review it in fewer than 50 characters: "Call me Bessie, 'cos I've been thoroughly milked") wrote that the "weeperific musical extravaganza" is "designed to make us feel every emotion fortissimo - because pianissimo is so 1862." Fish equates raw emotion exclusively with Bigness -- and yet there's something to be said for the virtues of modulation in a musical or dramatic work. He quotes Dana Stevens in Slate, who wrote: "We're all familiar with the experience of seeing movies that cram ideas and themes down our throats. 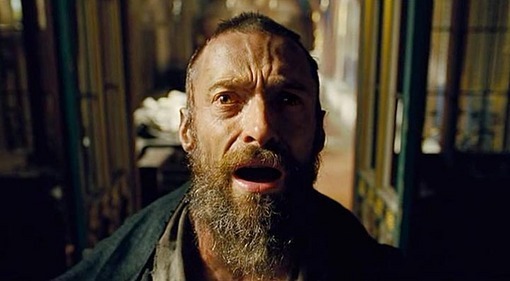 'Les Misérables' may represent the first movie to do so while also cramming us down the throats of its actors." What's more, when we witness so many extreme facial contortions at such close proximity, there's no room left for our own emotions because the actors are filling every square inch of screen space with theirs. This is, I think, a fatal miscalculation on Hooper's part. You know the expression, "How can I miss you if you won't go away?" The movie of "Les Misérables" prompts the musical question: "How can I feel anything for you if you won't shut up about how much you're feeling?" 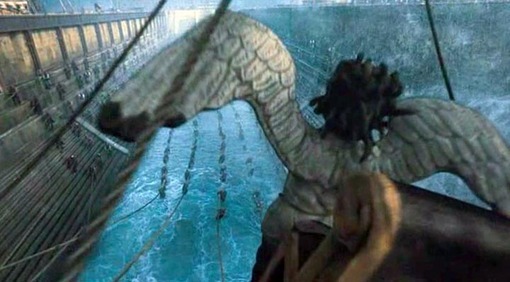 The picture starts with an aerial variation on the infamous CGI shot through the carafe handle in "Panic Room" (though here the CGI slips through an opening formed by the CGI figurehead on the prow of an enormous CGI ship). CGI waves splash over the "camera" (if that's what it is). In retrospect, this appears to be Hooper's not-too-subtle metaphor for tears to come. At 158 minutes, this is a long musical film (it's was a long book, and I'm talking about Victor Hugo's, not the libretto) but I was shocked to find that it has only one song, and that's the "Dream-de-Dream-de-Weem-de-Weem" song. The other musical numbers seem to draw their melodic inspiration from the recitatives, the kinds of tuneless tunes you might absent-mindedly whisper under your breath while you vacuum -- only here, of course, they're belted out at the tops of the actors' lungs. What's worse are the lyrics, which consist almost entirely of minor variations on "I am this character and this is my situation and this is my feeling about that." (Has "South Park" done "Les Miz"? Come to think of it, yes: It was in 1999 and it was called "South Park: Bigger, Longer and Uncut.") The songs, like the performances, are aimed directly and almost exclusively at the audience -- whether it's the soliloquies, the duets or the group numbers (in which, for example, poor people working in a factory explain to us en masse that they lack money, work in a factory, and how they feel about those things, philosophically and existentially). Maybe its the translation from the French that makes the language sound so stilted, but the way the songs are conceived and deployed -- not to dramatize the story or develop characters, but simply to point out their existence -- it's as if Rodgers and Hammerstein never happened, not to mention Stephen Sondheim. Tell me quickly what's the story Who saw what and why and where Let him give a full description Let him answer to Javert! In this nest of whores and vipers Let one speak who saw it all Who laid hands on this good man here? What's the substance of this brawl? (Somebody call in Dr. Seuss for a punch-up!) You'll notice a pattern here: It's never enough to simply show a brawl or a factory; somebody has to come in and sing that there is one, or was one, and explain his relationship to it, including his title or job description, as the case may be. 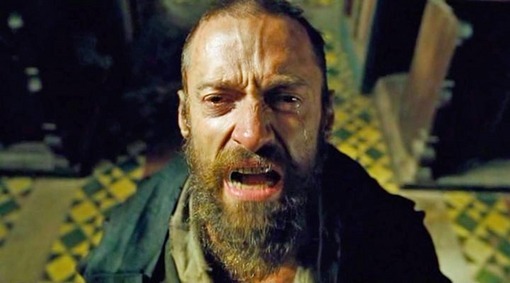 David Edelstein (New York Magazine): "The tasteless bombardment that is 'Les Misérables' would, under most circumstances, send audiences screaming from the theater, but the film is going to be a monster hit and award winner, and not entirely unjustly. [...] [Hooper] ... films every actor--heroic, villainous, beautiful, ugly--from the same vantage, which I'd chalk up to the democratic spirit of 'Les Misérables' if I thought Hooper knew what he was doing. He loves his actors to death." Christy Lemire (Associated Press): "Tom Hooper's extravaganza, big-screen telling of the beloved musical 'Les Miserables' is as relentlessly driven as the ruthless Inspector Javert himself. It simply will not let up until you've Felt Something -- powerfully and repeatedly -- until you've touched the grime and smelled the squalor and cried a few tears of your own. It is enormous and sprawling and not the slightest bit subtle. But at the same time it's hard not to admire the ambition that drives such an approach..."
And those excerpts were from positive reviews. Like it or not, "Les Misérables" makes an impression. 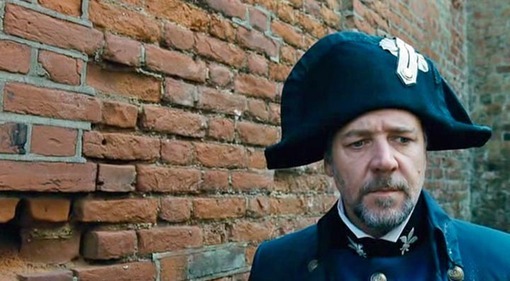 Near the beginning (and seemingly in every scene thereafter), Javert says/sings: "And I'm Javert! Remember my name." I do. : "That song is worse than all of Andrew Lloyd Webber, and it's worse than 'It's a Small World After All.' [It's] the all-time most horrible song ever in history, and the reason is simple: It sticks in your brain and never stops playing ... And just when you think it's gone, you see the title in print, and it starts playing again." 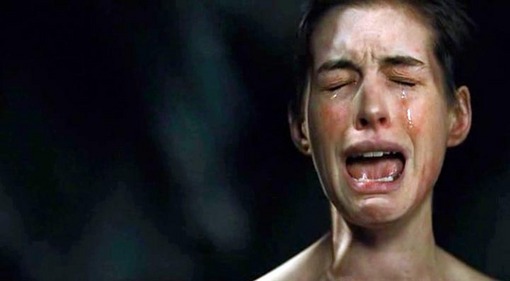 Here, it comes at you via Anne Hathaway after her character, the unwed mother Fantine, is persecuted ("You play a virgin in the light / But need no urgin' in the night"), shorn of her locks, and raped. She does it in a single take in a ghoulishly tight close-up, and although her plucked-chicken appearance is frightful, I was filled with admiration when she hit the big notes and stole the song back from [Susan] Boyle. I even joined in the applause. 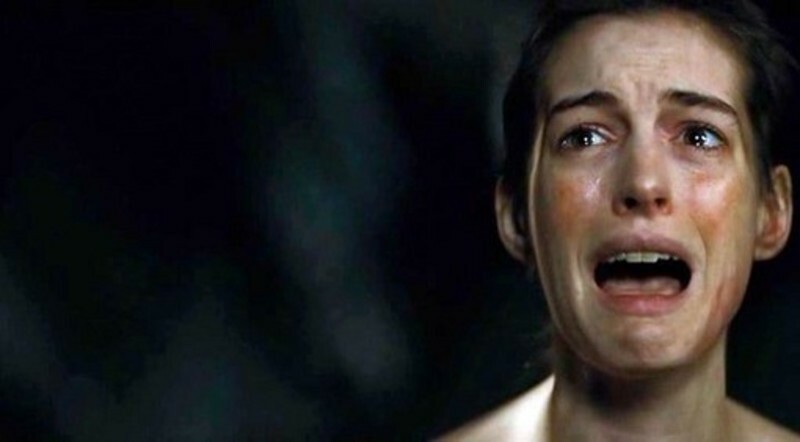 Hathaway will win many awards for this performance, if for no other reason than the image of her giant mouth will imprint itself indelibly on millions of brains, some belonging to Oscar voters.